G.O and Mir tell a tragic story in still pictures. This MV was requested right after MBLAQ’s “Cry,” which is cool since they both have the same water-droplet effect. But that’s basically it for uniqueness with this song, since what follows seems to be a pretty standard ballad with the welcome addition of rapping. It’s pretty, certainly, and I wouldn’t mind if a hot guy from MBLAQ were to sing it to me, but there’s nothing special that differentiates it from other ballads for me. The highlight is how lovely and good at expressing emotion G.O’s voice is. G.O, or Jung Byunghee, if you prefer. I like the nice escalation to the climax of the song. The requester is probably going to kill me, but honestly I didn’t really like the video—even though it is unique and creative and also charming in a way. This kind of storytelling in pictures can be really effective and understated, but I don’t feel like it lived up to its potential. In addition, it has this cheap fan-made look, like “I just threw a bunch of pictures together with a filter on Windows Media Player,” and I don’t think you can avoid that impression when telling a tale with pictures slowly fading in and out. When I feel like I could make a music video of roughly the same quality, illiterate though I am with video technology, that’s an issue. It makes screen caps easy, though, lol. G.O is Charlie Chaplin. We open on a ~mysterious card~ left behind on a bench with a photo of a happy couple in it. My interpretation of this is that G.O found the card lying around and imagined what his life would have been like if he had met the lady in the photo. As the title implies, much of this music video takes place in G.O’s fantasy: G.O imagines that he meets the love of his life and fantasizes about the events that lead up to them marrying. 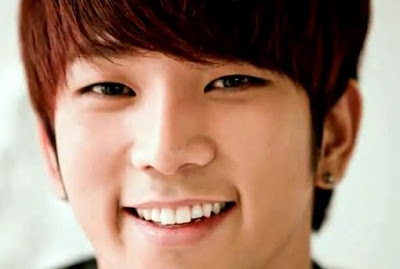 G.O has a great imagination, even including his best friend, Mir, in the thought experiment. 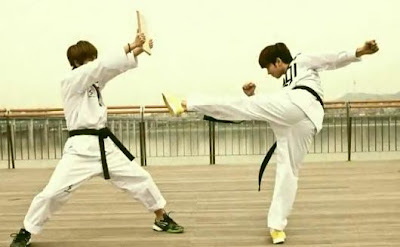 He imagines that he and Mir meet and practice some kind of Korean martial arts—I’m guessing hapkido? (I don’t know my martial arts, sorry.) But it’s implied that although G.O’s friendship with Mir is strong, the woman is coming between them, tearing the picture between them as a metaphor for the guys’ friendship. Yet another instance of hoes before bros. 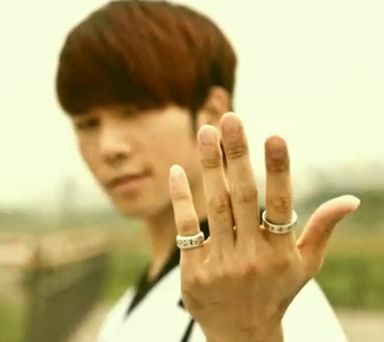 But G.O dreams of proposing, and finds a way to include Mir so that he doesn’t feel left out. It’s the most funny sequence in the music video. And then we return to reality, revealing that the ~mystery card~ holds a photo showing that G.O’s fantasy wife has married someone else (and seems pretty happy, too). Sad? Maybe. Kind of pathetic of G.O? Definitely. On an unrelated note, THAT MAN HAS BEAUTIFUL HANDS. Those hands are made for piano and huge, tacky rings. Honestly, though, I found this storyline pretty confusing, so I wouldn’t be surprised if there’s something I missed. No dance, unless you count martial arts! Yeah, but the more I think about it, the more I would like G.O to grow his facial hair out again. He looked sexier and more distinctive with it. But I understand if he felt it was too burdensome or that he was a “slave” to it. I’m oh so tempted to give this to Mir, but I think nothing beats G.O’s epic tear when he thinks about what might have been. It made me really sad. Nope, sorry. Ballads aren’t my thing, generally. It was nice to see G.O work on a solo venture—well, solo with Mir. I feel like Joon gets most of the attention in MBLAQ, so it’s nice for the spotlight to shift once in a while.